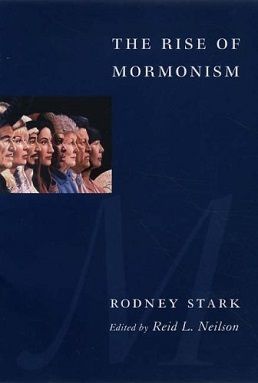 The Rise of Mormonism is a 2005 book by the sociologist of religions Rodney Stark. It was reviewed in a number of scholarly journals. Stark, Rodney (2005). The Rise of Mormonism. New York: Columbia University Press. ISBN 0-231-13634-X. ^ Flake, Kathleen (July 2007). "Review of The Rise of Mormonism". The Journal of Religion. 87 (3): 444–446. doi:10.1086/519881. ^ Shepherd, Gary (2008). "Review of The Rise of Mormonism". Sociology of Religion. 69 (2): 239–240. JSTOR 20453221. ^ Gooren, Henri (March 2009). "Review of The Rise of Mormonism". Journal for the Scientific Study of Religion. 48 (1): 209–211. JSTOR 20487001. ^ Romig, Rene (2008). "Review of The Rise of Mormonism". The John Whitmer Historical Association Journal. 28: 324–326. JSTOR 43200465. ^ Burd, Gene (2006). "Review of The Rise of Mormonism". Utopian Studies. 17 (3): 588–590. JSTOR 20718876. ^ Mouw, Richard J. (December 2006). "Review of The Rise of Mormonism". Church History. 75 (4): 937–939. JSTOR 27644904. This article about a biographical or autobiographical book on Latter Day Saint personalities is a stub. You can help Wikipedia by expanding it.